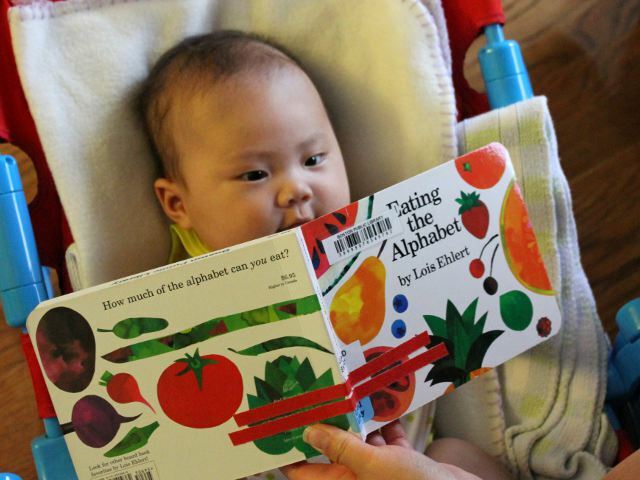 Since Arya enjoyed reading a different book by the same author, I figured she might like Eating the Alphabet by Lois Ehlert as well. My daughter loved staring at the pictures of food. She kept reaching out to touch the brightly colored fruits and vegetables. Eating the Alphabet is not a traditional baby book. Rather than a story or even full sentences, Ehlert simply shows pictures of foods next to their name. The foods are displayed in alphabetical order by first letter starting with an apple and ending with a zucchini. Surprisingly, the author found at least one food beginning with every letter of the alphabet. Quince and ugli fruit are good choices for Q and U while Ehlert relies on Indian corn (shortened to corn in American English) vegetable marrow (a British English synonym for squash) and xigua (Mandarin Chinese word for watermelon) for I, V and X. Images are easily recognizable for all but the most obscure foods. Eating the Alphabet would be great to take to the supermarket to occupy older children during a shopping trip. Thankfully all of the foods are fruits and vegetables. There are no fast foods, product brand names, or meat. In fact the book is even vegan friendly with no dairy or fish. Each letter is introduced in both capital and lowercase forms next to the foods starting with that letter. The name of each food is similarly written in both all capital and all lower case letters. Many of the foods that will make up Arya’s earliest solid foods are present in the book. We plan to show her bananas, peas, carrots, and potatoes from Eating the Alphabet before showing her the real life versions in the supermarket. Then after we get home with her food we can show her the book again just before we feed her the mashed versions safe for her to eat. Since we already like two of Lois Ehlert’s books, I am on the lookout for more of her several dozen children’s books. Unfortunately as Ehlert does not have a personal website I have to use the webpage provided by her publisher. I am still waiting for a better deal on her best known book, Color Zoo, which won a Caldecott Honor in 1989. Eating the Alphabet costs (including shipping) $13.42 new with school and library binding or as cheap as $3.49 used in paperback form.